This year has been challenging for teachers for a myriad of reasons. Research shows stress, PTSD, and mental/emotional health issues are running rampant for teachers around the country. Faced with the Trump Effect, many teachers are not only faced with the stresses and fears of students, but with their own fears about the future of public education itself. Our hopes for public education’s progress has been doggedly trampled over the last year with Betsy DeVos at the helm of the Education Department. The Department’s workforce has declined by almost 10% over the last year, and many key positions that require presidential appointment remain unfilled. DeVos’ stated reasons for continuing to strip the Education Department’s professionals is to return control of education to the states. But the Department serves key roles in our national education environment and is the only protection against education inequity amongst states. The Department of Ed historically has specifically worked to expand civil rights and enforce civil rights law in schools. Prior to this administration, the Department was also working very hard to help students burdened with debt brought on by for-profit colleges and unscrupulous lenders. In fact, the Office of Civil Rights in the department has experienced the deepest cuts, despite severely rising discrimination complaints in the last year. DeVos has sought to cut $9.2 billion from the Education Budget and wants to eliminate teacher training, college prep programs for underserved students. She has rolled back Obama-administration established rules about investigating sexual assault in schools. And the Washington Post reports that 87,000 applications for student debt relief are being reviewed by only 14 staff in the department. The lack of nominees for key staff positions means that focus on assistance for efforts that specifically help Latino, African American, and Native American/Alaskan Native students have languished. DeVos’ staff insists that the cuts do not reflect her commitment to civil rights and equity. But DeVos herself defies that with her released priorities for Department of Education grants. Her No.1 priority is School Choice, which means funneling public funds into private and religious schools, rather than using the money to expand opportunity universally for American students. The fact is, the United States Constitution protects no right to an education. Because of this, funding and conduct of education is left to the states. Over the decades, this has meant that students around the country receive widely unequal education opportunities depending on how their state values education. For example, New Yorkers prefer to fund a higher investment in education and spend about $20,000 per student. But Arizona spends only $7,000 per student. This discrepancy means that students are getting unequal educations from the start, not to mention different academic standards, opportunities, and support. DeVos’ Department of Education has no plans to address any of these issues, but instead will exacerbate the problem with her personal religious priorities. 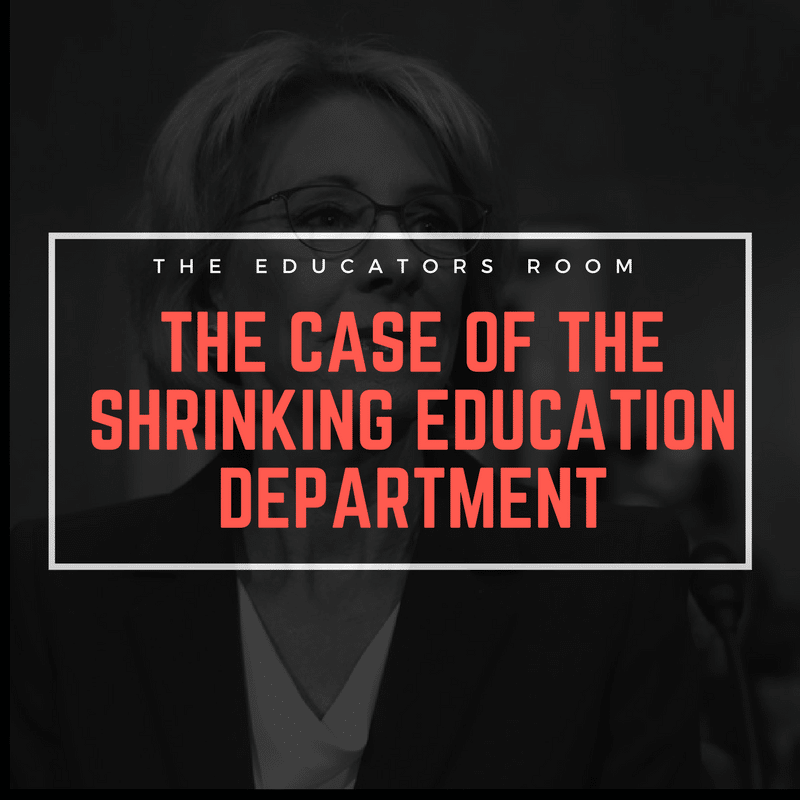 As the Department of Education shrinks and support for students and teachers around the country follows suit, once again teachers and students will be left with the effects. Elections have consequences, and as we have seen, the consequences of the 2016 election mean that cabinet level departments are disappearing at exceptionally fast rates at the hands of their Secretaries (the State Department is another frightening example with broad consequences). As they do, it will be up to those of us on the front lines to pick up the pieces, defend our students’ right to an education, and fight for better outcomes.